Happy Monday loveys! (I can hear you complain, “ah, not so loud, it’s Monday morning!”). True, so we will keep easy for today. How about some good food and hotness to start the week right? Below is the recipe of the first meal that Aiden and Elisa share. Can you guess where it was? It was at Aiden’s home, for her graduation (that she decided to skip). Roasted Wild Salmon and Apple-Fennel Salad. It’s super-easy! As I was finished editing Thirty Nights, I got the idea of collecting all its recipes and sharing them. So here is the first. Hope you enjoy it. I actually felt good after eating this (trying to use my “first book fifteen”). Preheat oven to 350 degrees. 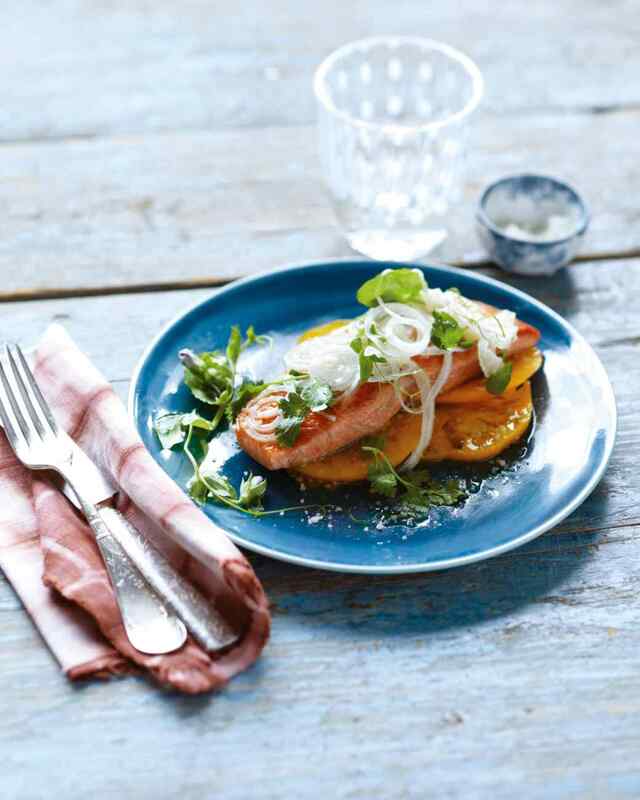 Mix five tablespoons of the olive oil with the lemon juice and rub each salmon fillet. Add 1 tablespoon oil to a large ovenproof skillet over high heat (preferably Pyrex), and swirl to coat pan. Layer the lemon slices and fennel on bottom. Place salmon, skinned side up, and surround with the cherry tomatoes. Sear until golden, about 3 minutes. Flip salmon, and transfer to oven. Roast 5 minutes (for medium). Take out; season salt and pepper; drizzle some olive oil over it; and garnish with the flat-leaf parsley sprigs. David Gandy: The Appetizer, Entree, and Dessert of Every Meal.